St. Patrick’s Day was already this blogger’s favorite binge-drinking U.S. holiday, and now there’s even more reason to celebrate. Paul Crowley, age 81, and grandsons will be taking advantage of the Mexican-themed celebration to host the grand opening of O’Crowley Irish Tacos & Juice Press Smoothies in Lindon, Utah. 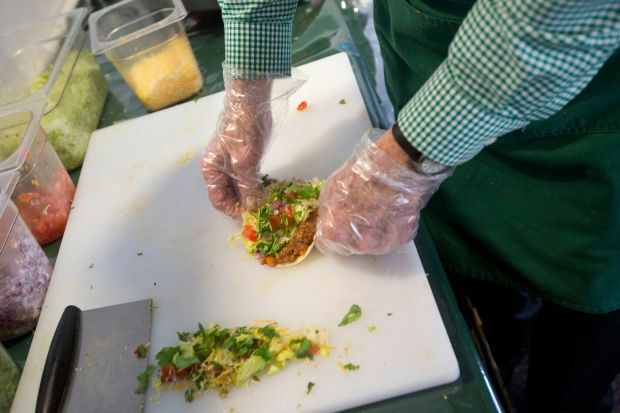 Irish tacos […] are made with shredded potatoes and can be topped with onions, cilantro, avocado and the regular lettuce, tomato, cheese plus sour cream and.. salsa verde. I don’t know about you, but I’d love to try grandpa’s Irish tacos. They look like they would perfectly fit in one of these awesome taco truck taco holders. … if I only lived in Utah. This entry was posted in Awkard homages, Food, Latin America, Stupid propositions and tagged irish tacos, st. patricks day, tacos. Bookmark the permalink. As a gringo, Catholic and part Irish, you Mexicanos own us! Now, I just learned that some of my ancestors went to Mexico and even joined the Mexican army. Wow. Those look like great tacos! As a gringo Catholic who is part Irish, I’d say you Mexicanos really own us. I just learned from one of the links in this article that many of my ancestors crossed the Mexican border, went to mass, played soccer with Mexicanos and joined the Mexican army. Wow! Those do look like great tacos! Better than corned beef and cabbage, lol.